Are you involved in conformity assessment? We have standards, publications, interpretations and other resources about conformity assessment. CASCO is made up of a number of groups that take care of different tasks. 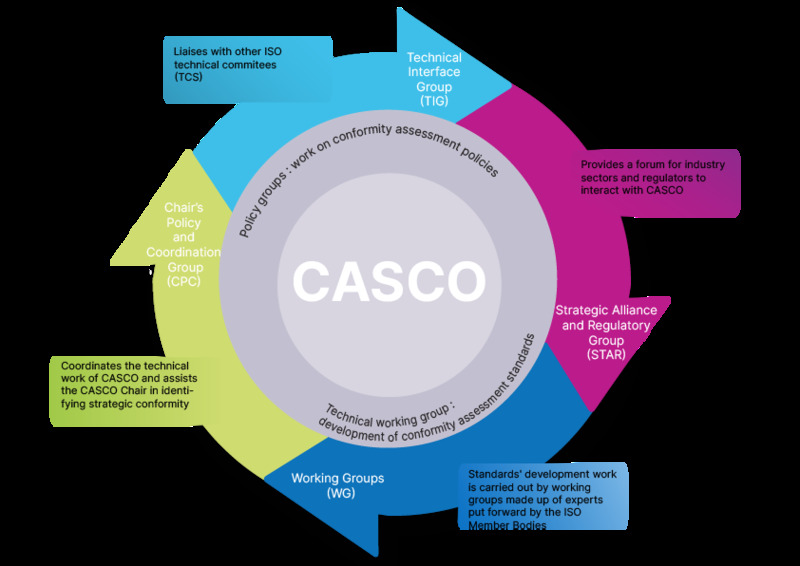 CASCO's standards' development work is carried out by working groups made up of experts put forward by the ISO Member Bodies. The experts do not always belong to the member body but represent an expertise required by the working group. Read more about current standards development projects . Chairman's Policy and Coordination Group (CPC) coordinates the technical work of CASCO and assists the CASCO Chair in identifying strategic conformity assessment issues. Technical Interface Group (TIG) liaises with other ISO technical committees (TCs) in order to ensure a consistent and harmonized approach to conformity assessment in those TCs. Strategic Alliance and Regulatory Group (STAR) provides a forum for industry sectors and regulators to interact with CASCO. Get an overview of conformity assessment and what CASCO does by spending five minutes with CASCO. Membership to CASCO is open to all ISO members. Details of current members can be found in the full list of CASCO members. CASCO has established liaisons with international organizations active in conformity assessment. The aim of many of these liaisons is to promote the CASCO toolbox (the collection of CASCO standards) and the harmonization of conformity assessment activities throughout the world. Details can be found in the full list of organizations in liaison with CASCO (bottom of the page). CASCO also works with different ISO technical committees whose work is related to conformity assessment. Details can be found in the full list of technical committees in liaison with CASCO. CASCO also has an active partnership with ISO's standardization partner, the International Electrotechnical Commission (IEC). IEC is responsible for International Standards in the electrical, electronic and related areas, as well as operating a number of global certification schemes for products in its field. The majority of CASCO documents are published as joint ISO and IEC documents. More information on the technical committees in liaison with CASCO, organizations in liaison, CASCO's work programme, and contact details can be found on CASCO's committee page.